Hi, there was a boating/surfing incident on the river this weekend with a windsurfer who broke his leg. I'm trying to find the guy, I have his board and sail, but have no idea how to find him. Anyone know the guy? Seabreeze to the rescue again! Was It Peter Mac ? Anyone know where they took him ? Yep it was Pete M.
I've tried Pete M phone number but off ! Some of us keen to make sure he ok ! Was it really peter mac? Yep, get well soon Pete. Anyone got details of the accident where / how etc? i hope he is doing well. Heavy Weather will be too quiet without him! Bugger!!!!!!!! Pete, hope you are back on the water soon. Hope you're OK Pete! Scary hurting your self out there huh? Hope you are ok Pete. it's amazing how all the seebreezers are concerned about each other when a man has injured himself. Don't know you personally Pete, but as someone mowed down by a boat while windsurfing, understand how you feel. Best wishes for a speedy recovery Peter. Peter has indicated on the phone that he would prefer not to have any visitors for now. However, any alternative/addition to hospital food is welcome- just give it to a nurse in Ward G to pass on. (Anything organic is a winner). all the best for a speedy recovery! Bugger Pete, I hope you're up and bouncing over the chop soon, all the best mate. I feel this could potential have happen to any of us sailing on the river, with the heavy boat traffic at times. Not sure of the exact details etc. There is only one unique Scottish Pete on the river, and we need you back out there mate. Sorry to hear the terrible incident that would affect you both mentally and physically for months to come. I hope for a speedy recovery and racing me on the river again. I'm not looking forward to the earth is flat talk, jfk or the world trade centre stuff but love having ya out and about. 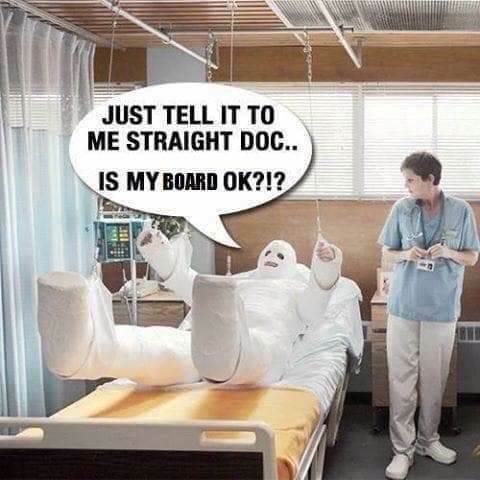 We all need a laugh in hospital was this you? Get well soon Peter, who will I drag race now? I read this entire thread to Pete today and he was very touched and appreciative of the good wishes. He asked me to mention on here that he would be happy to receive calls. He has his own phone connection in the hospital- Just call 9224 5600 and then enter 0681808. He has had two operations so far, and is waiting for more on Friday so there's a lot of lying around with nothing to do, so any chance to have a chat on the phone would really help to cheer him up! Anyone got the low-down on what happened? I was sailing with him around the far yellow mark on the other side of the channel and the white buoy near the pelican. I gybed around the yellow mark and he was coming into the mark as i was heading back to peli. Thats the last i saw of him and he really can't remember much but i think he must have been cleaned up on the run back into Peli. I'll give a statement to the police tommorrow.